Electric vehicles are widely expected to become the dominant form of personal transportation as cities and countries around the world look to complete bans of new internal combustion vehicle sales in the coming years. Shifting the world to this new technology is disrupting the entire automotive industry and gives hope that the world just might have a chance when it comes to combatting climate change and shifting to new, zero-emission technologies like electric cars. But as with every new technology, electric cars as well as the related stationary energy storage that will store the renewable energy being generated to power them both have a dark side. The primary chemistry — lithium ion — being used for the electric vehicles being produced by some of the leading manufacturer in the space, including Tesla, utilize supply-constrained cobalt. Cobalt is a byproduct of copper and nickel mining and not found in many locations around the world, with one single country supplying the bulk of the world’s demand for cobalt. Bloomberg dug into the matter and found that 63% of the cobalt produced last year came from the Democratic Republic of the Congo in central Africa. DR Congo is still in the early stages of recovering from a vicious civil war 15 years ago that left the country in ruins, and with the price of cobalt on the London Exchange doubling over the last year and demand expected to rise up to 47 fold from last year’s levels by 2030 (Bloomberg), the situation is tenuous at best. Injecting billions of dollars into an already unstable economy is a recipe for disaster, so global consumers are looking elsewhere for more stable cobalt suppliers. One of those locations is in aptly named Cobalt, Ontario, in Canada, where silver and cobalt were found in the early 20th century. 2017 is bringing new promise for the town, which has had known cobalt deposits for years that are now coming back into focus. 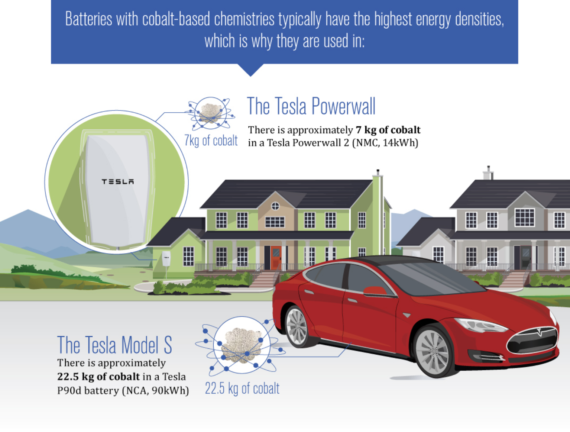 Cobalt is a relatively small component in Tesla’s massive batteries, with the average Tesla car estimated to contain 22.5 kg of cobalt and the Powerwall containing 7 kg. While it is not the bulk of the material in the battery, it is a critical component for one of the most widely used battery chemistries on the planet. 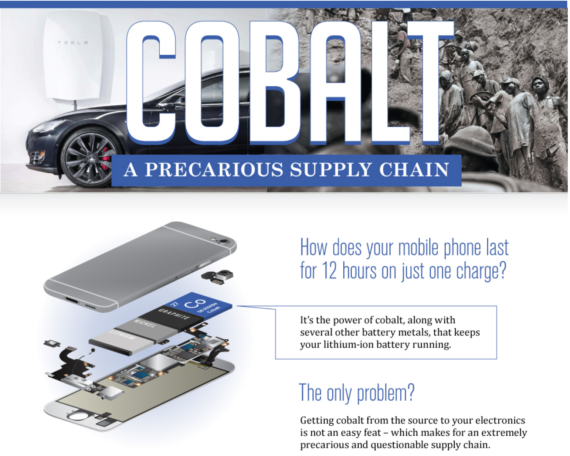 To date, global cobalt production has kept pace with the massive spike in demand that has followed growing demand for lithium-ion batteries for small consumer technologies and, more recently, electric vehicles. This growth in demand over the last 20 years has resulted in a 5x increase in production. To meet estimated future demand, new supply is needed, from more stable, reputable areas of the world. 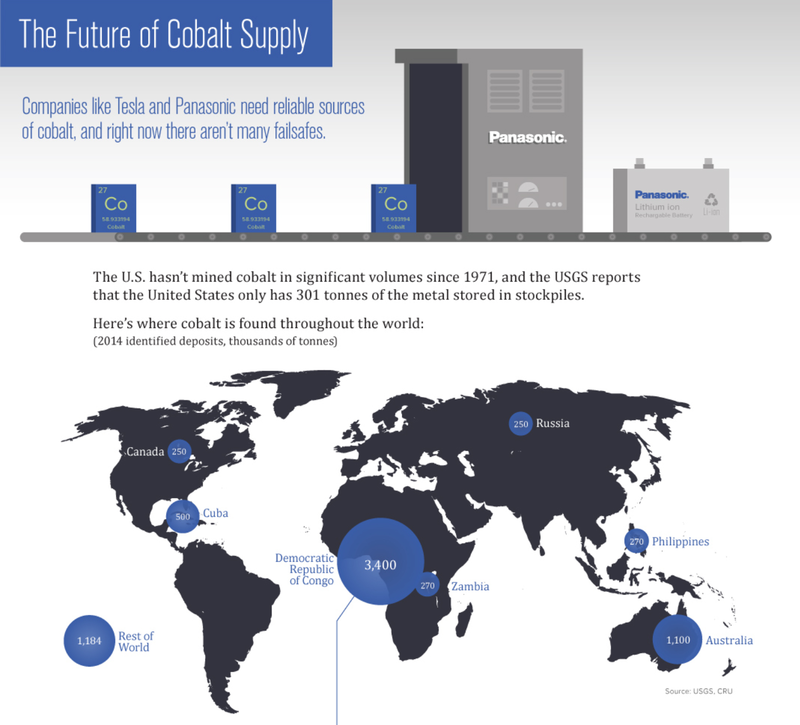 As noted above, Canada is being looked to as a source for cobalt to fuel the world’s transition to renewables, with Cobalt, Ontario, spotted for its history of mining and known reserves of cobalt. Grassroot junior mining exploration company LiCo Energy Metals (whose shares are primarily listed on the Toronto Stock Exchange TSX-V Symbol: LIC; secondly on the OTCQB Symbol: WCTXF; and lastly on the FRA-V Symbol: 43W1) has announced two major new cobalt exploration projects in Cobalt, Ontario. 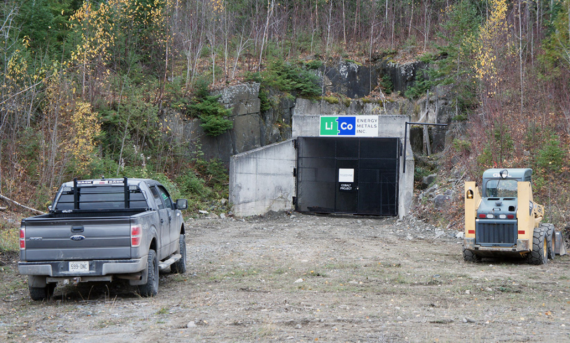 The new Teledyne and Buck properties that LiCo is developing are especially lucrative due to their location in the town of Cobalt, Ontario, which has more than 100 years of mining history. The town was put on the map by a silver mining boom in the early 1900s that catapulted it up into the 4th largest supplier of silver in the world before the silver mining bubble collapsed a few decades later, relegating the town to near ghost town status until recently. LiCo’s current drilling program taking place on their Teledyne and Glecore Bucke Cobalt properties. LiCo is also looking beyond these two properties with a focus on developing additional cobalt properties in the area. LiCo’s existing properties in Cobalt are ideally located due to their close proximity to a mill that should be able to process the resulting ore. As increases in supply like this seek to fulfill the massive spike in demand for cobalt, every dollar saved in the process of extracting and refining the resulting material can improve the final cost of the product. Reducing the distance battery constituents travelled was one of the primary reasons Tesla chose Nevada as the location for its first battery factory, dubbed Gigafactory 1. 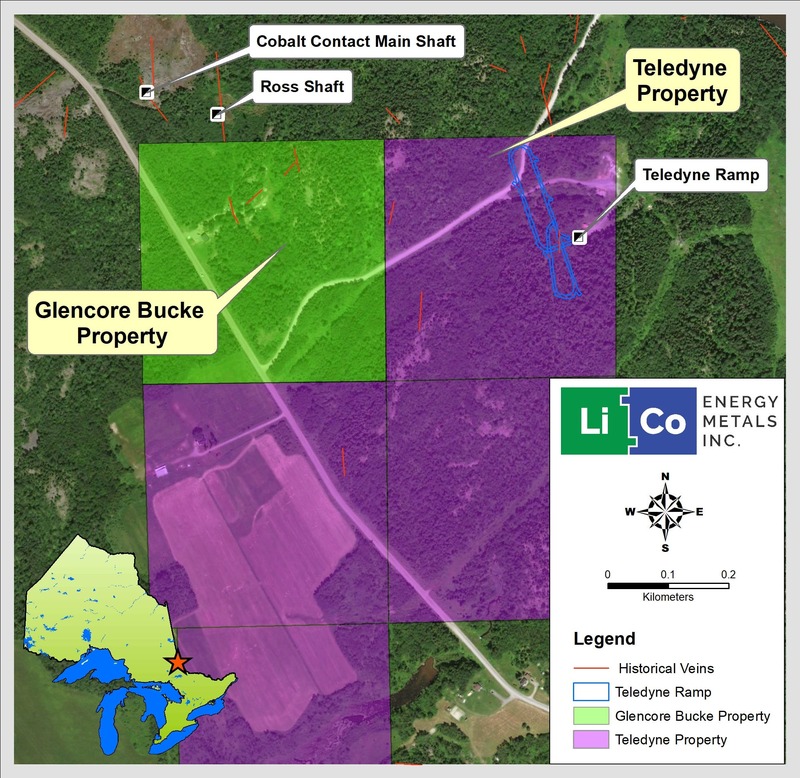 LiCo is already working with one of the largest names in cobalt, Glencore, and is working to maximize the existing assets at the Teledyne property, including a $25 million CDN adit — or horizontal mine shaft — dug for hauling cobalt out as well as for drilling into the mineral vein at a closer proximity. The adit (mine shaft) on the Teledyne property goes down 500 feet parallel to the primary cobalt vein on the property. 6 diamond-bored surface holes have already been drilled, with another 22 bored in from below to confirm the location of the cobalt vein. LiCo has added a second drilling rig to its adjoining properties to expedite mining and extraction operations in Cobalt and is already seeing positive results from the initial exploratory tests from its Glencore property. In parallel, the Teledyne property is being prepared for the drilling of the first cobalt/silver targets. LiCo Energy Metals, Inc is a Canada-based exploration company focused primarily on lithium (Li) and cobalt (Co). The newly acquired Glencore property (mapped above) includes an offtake agreement and back-in option. The agreement states that if LiCo discovers one or more ore bodies having a minimum aggregate in-situ value of $100M worth of commercial-grade cobalt, international mining giant Glencore has the right to (back-in) purchase 51% of the project. Read more on these Terms of the Acquisition from Glencore here. The road to the sustainable, renewable energy future is not direct, but with hard work and a data-based approach to the problem, solutions can be found, created, and implemented. This post was supported by LiCo Energy Metals; infographic below (and images above) courtesy of Visual Capitalist, LiCo Energy Metals.